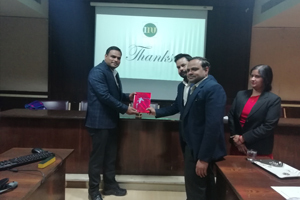 The Rajasthan Institute of Engineering & Technology organized an Seminar on “IoT & Fog Computing” on 31.01.19 eminent guest speaker who graced the occasion was Dr. Anil Saroliya who is the Associate Professor,Deprtment of CSE of School of Engineering & Technology Mody University of Science and Technology. On the onset of the session Dr. Anil Saroliya was welcomed by Dean Academics & Admin, RIET, Prof. Kapil Dev Sharma. Other dignitaries who graced the occasion were- Vice Principal RIET Dr.Sachin Sharma, HOD MCA Ms. Shikha Choudhary .The Seminar was attended by all Third and fourth year student of CSE Department. Dr. Anil Saroliya was the first batch Alumni of RIET Also. He worked on many project related to IOT and presently he developed so many concept in Modi university. 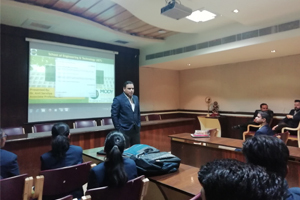 Dr. Anil Saroliya interact with the student and tell them the importance about the iot and fog computing. He gives so many example about the iot which we are using in Daily life. The internet of things, or IoT, is a system of interrelated computing devices, mechanical and digital machines, objects, animals or people that are provided with unique identifiers (UIDs) and the ability to transfer data over a network without requiring human-to-human or human-to-computer interaction.Fog computing use computing resources, especially to enable your digital transformation process for IoT devices. The session was very interactive for the students. 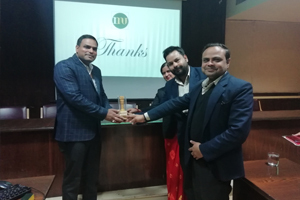 Dr. Sachin Sharma Give vote of thanks at the end of the session and Please our guest with memento.